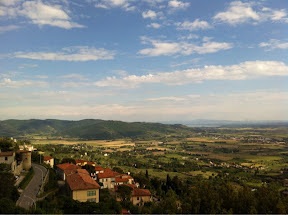 We've moved from one spectacular view to another as we arrived in Cortona Italy Saturday afternoon. It was a long day of traveling as we left the fabulous Villa Le Sirene at 5:45am for the long, winding trip to Naples, then a train to Rome where we said arrividerci to our friends and said buongiorno to our new group of travelers. Another train to Cortona where everyone settled in to their home for the week in this gorgeous 14th century village. We had a wonderful "light" lunch of regional cured meats, cheeses and vegetables accompanied by a few bottles of local wines. 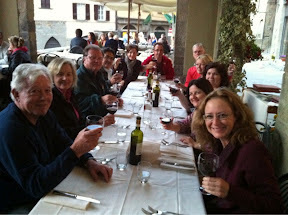 But more eating and wine drinking awaited as we walk to the center of town looking for our dinner at the beautiful Ristorante La Logetta overlooking the main piazza. We are off to a good start! Ciao!